Much has been written during the last calendar year about the rise of the super team in baseball. Over the last two seasons, the Dodgers, Astros, Cubs, Cleveland, and the Nationals have mixed some combination of years of effective draft and development, wise free agent acquisitions, enormous roster depth, superstars who are frequently young and cost-controlled, and (in a few cases) large payrolls to build division-winning titans capable of 100+ wins. However, I come to bury these Caesars, not to praise them. I’m not interested in how these types of teams were built. Rather, I’m more interested in determining which other talent distributions are most effective. Not every team can amass the combination of depth and superstars the super teams have. Obviously, it’s best to be both deep and talented. But if being both deep and star-laden isn’t an option, is it better to be extremely deep? Or is it better to possess lots of top-end talent, even if it’s surrounded by subpar talent, the so-called Stars-and-Scrubs model? Let’s take a look at MLB roster compositions and see which non-super team methodologies work best. To start testing out the effectiveness of talent distributions, let’s first establish some parameters. I’ve chosen to collect data since the 1988 season. This gets us a nice round number with 30 years of data. It also gets us past the collusion issue from the mid-1980s, as the ruling that owners had colluded came down in September of 1987. Most importantly, the streams with which teams acquire talent have not changed in that time frame. Free agency, trades with a late-July/early-August trade deadline and waiver trades afterwards, the Rule 5 draft, international markets, and the waiver wire are all methods that have been used since 1988. Talent evaluation has changed significantly in that time, and the amount of use for each of those methods of talent acquisition has ebbed and flowed, but the mechanics are almost exactly the same today as they were in 1988. I’ve collected WAR for all position players with 50 plate appearances or more, and all pitchers with 20 innings pitched or more, since 1988. Then I’ve determined the percentage of a team’s playing time that went to each player and pitcher. To make that determination, I’ve divided each hitter’s total plate appearances by his team’s total number of non-pitcher plate appearances. For pitchers, it’s the same formula with innings pitched substituted for plate appearances. Next, that percentage is multiplied by 0.57 for hitters and 0.43 for pitchers, based on Neil Weinberg’s calculations. For a real-world example, let’s honor the recently retired Carlos Beltran. In 2013, Beltran took 600 of the Cardinals’ total 5,830 non-pitcher plate appearances. That’s 10.29 percent of all plate appearances. Using the 57 percent rule, we multiply his 10.29 percent of all plate appearances by 0.57. Beltran’s total contribution to the 2013 Cardinals was 5.87 percent. Relief pitchers pose their own problem, as relief pitcher WAR is depressed. Using the above table, a 3 WAR reliever would be a good player. However, a 3-WAR reliever is one of the best at his craft in all of baseball. Just 29 individual reliever seasons since 2000 have reached the 3-WAR barrier. To remedy this, I’ve instead used WPA to rank individual reliever seasons. Using the order of relievers from top to bottom, I then distributed all relievers in the same frequency that hitters and pitchers were distributed. Of all hitters and starting pitchers, 1.67 percent produced 6+ WAR (an MVP designation). As such, the top 1.67 percent of relievers by WPA were given the MVP designation. Scrubs accounted for 57.47 percent of all starting pitchers and hitters, so the bottom 57.47 percent of relievers by WPA were designated as a Scrub, and so forth. From this point, I added all of the percent contributions for every player on each team since 1988, broken out by player type (MVP, Superstar, All-Star, Good, Solid, Role, Scrub). Moreover, I needed a good working definition for three new categories: Depth, Star, and Scrub. The Scrub designation was obviously the easiest, simply using the same definition offered by FanGraphs (players with < 1.0 WAR). For Depth players, I added the percent contributions received for players between 1.0 and 3.9 WAR (or the corresponding WPA for relievers). Finally, Star players are defined as all players at 4+ WAR. 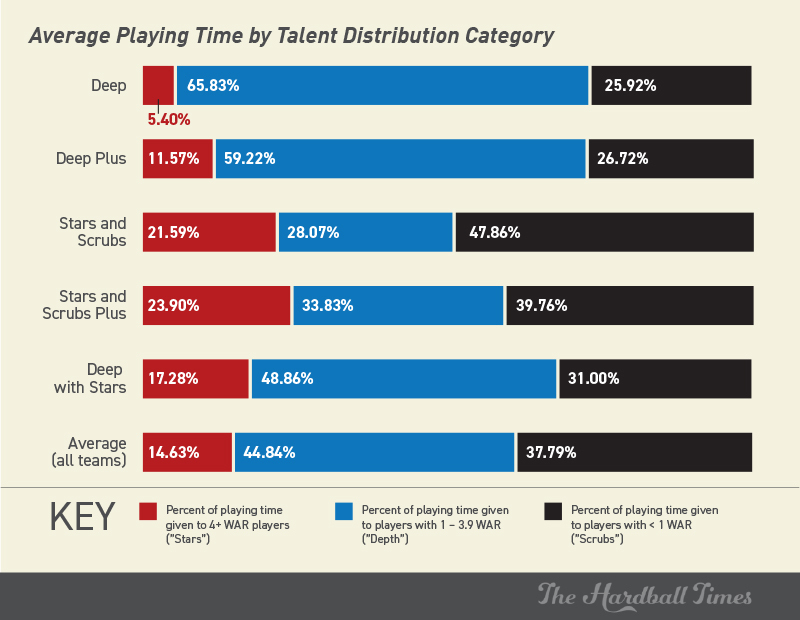 This gave me a talent distribution for each team: the total percentage of available playing time each team gave to Scrubs, Depth players, and Stars. For some perspective, the average team since 1988 gave 14.63 percent of its playing time to 4+ WAR players (“Stars”), 44.84 percent to players between 1.0 and 3.9 WAR (“Depth”), and 37.79 percent of their playing time to players under 1.0 WAR (“Scrubs”). There are many reasons for including these categories. First and foremost, I want to determine if either the Depth model or the Stars and Scrubs model is better. Second, I want to illustrate just how much more effective it is to have both depth AND stars. And finally, I want to illustrate how much of a difference it makes for a deep team to add some more star power, and how much of a difference it makes for a Stars and Scrubs team to decrease their scrub playing time. First, let’s take a look at the average composition of teams in these categories. The following graph shows the percent of playing time the average team from each category gave to players designated as Stars, Depth, and Scrubs. I’m also including the average of all teams in the sample (870 total since 1988) for context. You’ll note the total percentages add up to approximately 97 and 98 percent. This is because, depending on the individual team, approximately two percent of playing time goes to players who didn’t amass 50 plate appearances or 20 innings pitched. 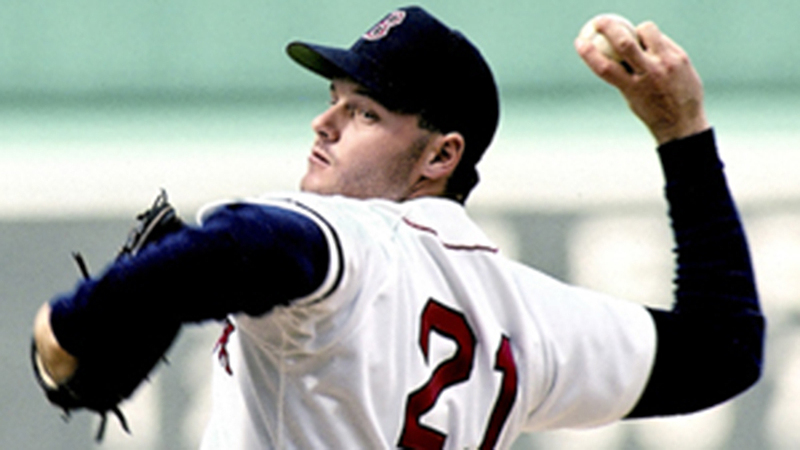 As far as some of the differences in percentages between the various categories, a good rule of thumb is that a full-time position player or a 200-inning starting pitcher receives between six and seven percent–approximately–of a team’s overall playing time. The difference in composition between the Deep and Deep Plus category, essentially, is that the average Deep Plus team has one more regular contributor in the Star category and one fewer in the Depth category. Now let’s take a look at how these teams fared, using the collective Pythagorean record for all teams in each category. This is presented as a box plot. The top and bottom dots represent the maximum and minimum pythagorean record, respectively, for teams in each category. The top box illustrates the range of the second-highest quartile for pythagorean records, and the bottom box is the third quartile. To help illustrate the type of teams that fit the edges of these categories, I’ve identified the maximum and minimum teams. Finally, to show the full range, I’m including a dot plot for each team in each respective category. These are listed to the left of the box plot for the category. We are admittedly dealing with some small sample sizes, but the Deep teams clearly outperform the Stars and Scrubs model. The difference in the collective pythagorean record between the two categories is .038, or 6.16 wins over the course of a season. And lest you think it’s a function of a few particularly strong teams in the deep category, we can answer that by looking at the second and third quartiles. The bottom of the third quartile range for Deep teams is just a smidge less than the top range of the second quartile of Stars and Scrubs teams. The 1991 Cardinals are the 27th percentile of deep teams, and they come in with a .502 pythagorean winning percentage. The 1990 Padres are the 76th percentile of Stars and Scrubs teams, and they carried a nearly identical .500 pythagorean winning percentage. We have our first answer. It’s clearly better to be a deep team than a Stars and Scrubs team. Now let’s take a look at our Deep with Stars category to get an idea of how much more effective those teams are compared to the other categories. The collective pythagorean record (.538) is .019 better than the Deep category (3.08 wins), and .057 better than the Stars and Scrubs teams, a whopping 9.23 wins per season. Where the Deep with Stars model really proves itself is in the second and third quartiles. The bottom of the third quartile is the 2014 Royals, with a .519 pythagorean winning percentage. Put another way, take all the teams since 1988 who gave between 13.8 and 20.35 percent of their playing time to stars, between 45 and 51.8 percent to depth players, and between 25 and 36.3 percent to scrub players. Of all of those teams, 75 percent of them were better by Pythagorean winning percentage than a World Series runner-up. The top of the second quartile is the 1989 Giants, another World Series runner-up, this time with a Pythagorean winning percentage of .569 (92 wins). Other categories have single outliers that outperform the maximum of the Deep with Stars group, but there’s so much quality packed into the Depth with Stars set that the outliers are completely moot. It’s also worth noting that this group doesn’t even represent the best possible version of a Deep with Stars model. The list of teams reaching the top quartile of Star playing time and the top quartile of Depth playing time (not listed in the graph) is a who’s who of juggernauts and World Series participants. Their collective pythagorean winning percentage is .570, a 92-win pace. Depending on the degree with which teams can collect stars and depth, it’s worth nine to 14 more wins than a Stars and Scrubs team, and three to eight more than a Deep team. An interesting pattern emerges when we infuse the Deep teams with more playing time from star-quality players and remove slight playing time from scrubs from Stars and Scrubs teams. The Deep teams receive a pythagorean bump of .012, or 1.9 wins. The Stars and Scrubs teams, however, leap all the way up from .481 to .520 in their collective pythagorean winning percentage. That’s an increase of .039, or 6.3 wins. The bottom of the third quartile for Stars and Scrubs Plus is higher than the top of the regular Stars and Scrubs model. That’s a significant jump. When the Depth teams become Depth Plus teams (slightly more playing time for star-quality players), the collective bump isn’t that significant. However, the floor rises considerably. 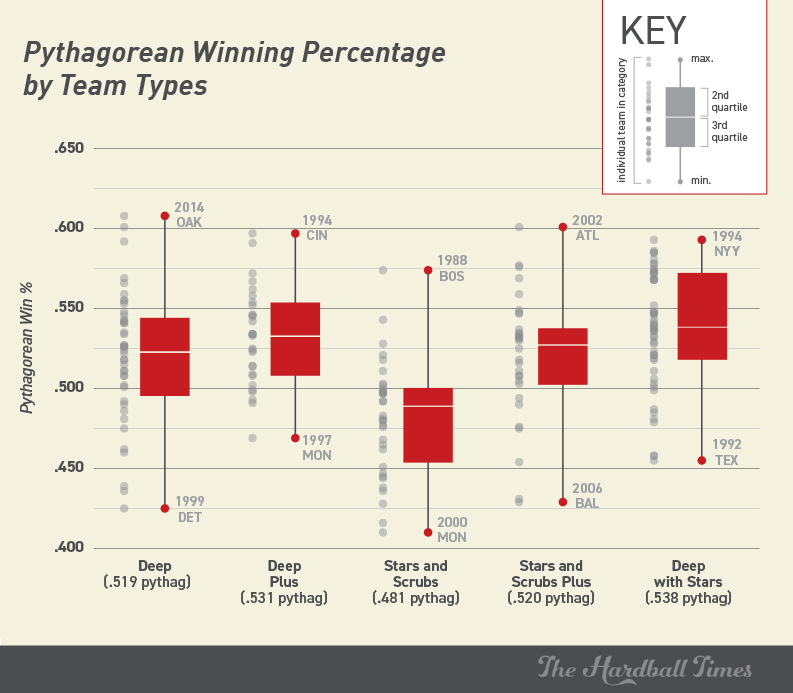 Five of the 41 Deep teams had lower pythagorean records than the worst team in the Deep Plus group. And the second- worst team in the Deep Plus group–the 2004 Tigers and their .491 pythagorean winning percentage–fared better than nine of the 41 Deep teams. There’s a lesson to be learned from the way the Depth and Stars and Scrubs groups reacted to their adjustments. The Depth adjustment to Depth Plus involved adding star-quality players. The Stars and Scrubs adjustment to Stars and Scrubs Plus involved decreasing the playing time contribution of scrubs. 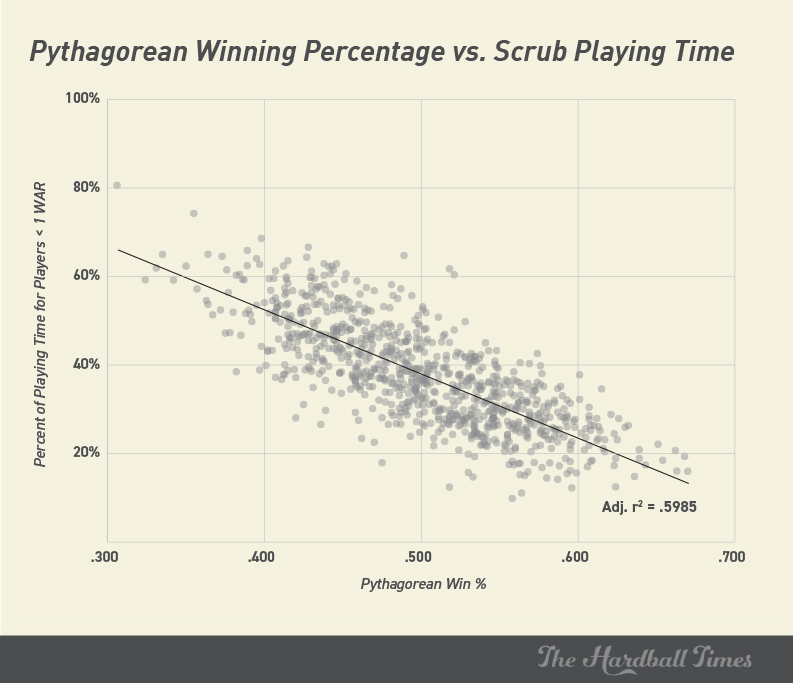 Once I noticed the impact decreasing scrubs had on the Stars and Scrubs group, I decided to test out each individual category (Stars, Depth, Scrubs) in a linear regression with Pythagorean winning percentage as the dependent variable. The Scrub category (playing time given to players with less than 1.0 WAR) returned the highest adjusted R-squared value by far, coming in at 0.5985. The Star category registered an adjusted R-squared of 0.4319, and the Depth group came in at just a 0.075 adjusted R-squared. The Scrub relationship is strong. Let’s take a look at that relationship in a simple scatter plot. Depth has its purposes, and it’s preferable to Stars and Scrubs. And giving a high volume of playing time to star-quality players obviously helps any team. But the quickest route a franchise can take in building a winner is simply to avoid giving playing time to scrubs, players under 1.0 WAR. This is easier said than done, of course. There are more considerations than you can count when it comes to roster construction: payroll, the quality of a farm system and the proximity of its talent in relation to the major league level, where players are on the aging curve, and many more factors. But the data still stand. The most impactful route to a winner isn’t in improving its depth or its stars. It’s in raising the floor of the roster, avoiding the scrubs. John LaRue is a graphic designer, former minor league baseball media relations director, and data visualization enthusiast. His work has been featured in The Best American Infographics 2013 and I Love Charts: The Book. Follow him on Twitter @tdylf. How did someone like Justin Verlander from last year rate? Was his entire WAR counted towards what his “role” would considered to be, or just what he did with the Tigers/Astros? I left it strictly in his production for each specific team. So in his case, it was a 1.1 WAR with Houston and 3.0 for Detroit. Both teams have him as a Depth player. In reality, his 4+ total WAR should have counted as Star quality. That’s a great catch, and I did not adjust for it. If I get a little time today, I’ll see if I can parse those out and see where it might make a difference with some teams. Really enjoyed the analysis. Did you compare these different categories looking at batter vs pitcher? For example, I think it would be interesting if you had a heat map with the y axis being the team category for pitchers and the x axis being the team category for batters and the measure being their pythag-Win%. Maybe star pitchers with scrubs and a deep lineup performs better? It might thin out the data, but just a thought. I didn’t compare pitcher depth to hitter depth (or stars or scrubs), but I think that’s a great idea for a future article. I can play around with it and see what turns out. How do the Giants teams of 2010,12,14 stack up?